My blog is one year old today!! WordPress has been great!! Already twice as many followers as I had on my old Blogger blog after 9 years. I have been putting off painting this sketch I made one Saturday nite when we sat under the Eiffel Tower enjoying watching it sparkle. So many people were there including the guys who hawked these twinkling Eiffel Towers and bottles of champagne. I imagine someone would be busy picking your pocket while you bought one. Pick pockets are terrible at the Eiffel Tower but we had nothing with us but our room cards, a sketchbook, and a pen or two in my pocket. No money. They gave up trying to sell us one when I sat down on the curb and started drawing. Once again I drew the people as they drifted by. So Happy Birthday blog. Thanks for following me. Oh TIP: How I painted this. Wish I had taken photos. First I painted the tower with Winsor yellow and let it dry. Then I painted the people with a mixture of mineral violet and cobalt and bits of burnt sienna and burnt umber. Then I painted the ground and the tower with Quin gold. Shadows got added wet on wet violet and cobalt. The dark sky was painted TWICE Inathrodone and burnt umber mixed. Let it dry between coats. If this were not in my sketchbook I might paint it again. Last I added shadows where the girders crossed. Trees. Ooops forgot them. Quin gold and Daniel smith green apitite with some of the night sky color painted over it. Is the tower accurate? NO! But it does give the feel of standing under the tower on a dark nite enjoying it twinkle with the rest of Paris. 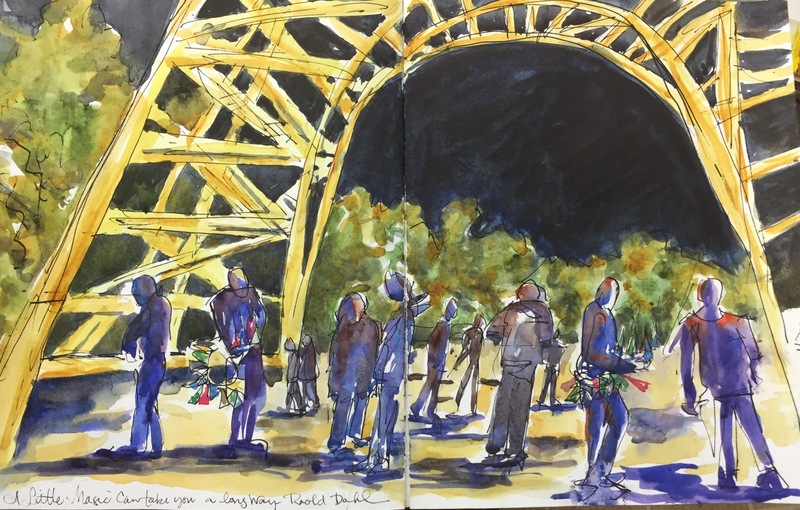 Day 561 – Rouen returns?! Changes!! Day 563 – Auvers sur L’Oise or How to make a Map!